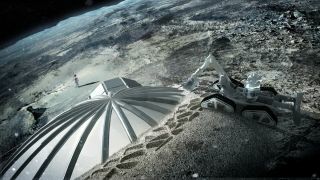 In this artist's rendering, a 3D printing robot pours layer after layer of hardened lunar dirt and dust onto an inflatable dome shell, 3D printing a lunar base. This story was updated at 4:55 p.m. ET. ESA and partners used this 3D printer to print a piece of the possible lunar home. Foster + Partners' 3D printed design is a simple four-person moon base that can be made completely out of repurposed moon dirt, which scientists call "regolith." An artist's illustration of what a base on the moon might look like. The European Space Agency is investigating the possibility of 3D printing lunar habitats. This 2,205 pound (1,000 kilograms)test-print is made from simulated lunar dirt and resembles a cross section of what the lunar home could look like.